On January 21, 2014 I argued that the Bank of Canada’s policy rate would continue to flat-line for the year despite market optimism to the contrary. I also disclosed that I had added long bond exposure to my personal portfolio with the view that 2014 would be a bounce back year for sovereign long bonds, specifically Canadian. Little has changed to deter the portfolio choice as the global landscape worsens. At home, in an era of what I believe are low rates for a very long time, financial repression is killing the spending capacity of retirees. A not so small point is that the front end of Canada’s baby boom generation began retiring last year. That is a trickle; a flood of retirees will follow. Central banks are relying on reduced interest rates to spark credit creation (and in turn a greater stock of private debt) to spark consumption. The price of real estate remains at a high in nominal terms in major cities like Toronto and Vancouver and household debt to income ratios remain high as well. To keep the not so virtuous cycle of consumption going will require the central bank to more encourage credit creation and asset price inflation to spur the industry that is growing –real estate development– however with the federal government attempting to balance its budget the output gap that the BOC calculates as a guide (but necessarily a final decision making metric for policy) is likely to expand rather than contract. With slack only increasing and knock on effects from oil’s price decline yet to be felt in the numbers that drive markets, 2015 will be another year of easy monetary policy. Absent increases in real wages of working and middle class workers there will be no spike in effective demand within the Canadian economy that will be sustainable. If anything, the case is now being made by Ted Carmichael and others for a policy rate cut. I agree with this view. While a rate cut on January 21 is unlikely the language leaning toward an easing bias may occur in the coming months. Reading the tea leaves of monetary policy statements is more art than science. If the BOC’s dovish language is enough then it will stand pat as long as it can but as the data flow increases and core inflation falls we will see a rate cut this year. George Magnus, former chief economist at UBS, in conversation with RT’s Erin Ade on the emerging markets sell off, the concern with China, the demographic challenges facing advanced economies as well as Russia and China, and an assessment of Ben Bernanke’s tenure as FED chairman. The Bank of Canada is set to release its interest rate announcement and Monetary Policy Report tomorrow morning at 10 AM (ET). There is an expectation of no policy rate change and the possibility of an easing bias by market participants. The former appears a good bet given the flow of economic data recently, from employment falling by 46,000 in December to inflation remaining below the BOC’s 2% target yet remaining just within the central bank’s (1% to 3%) operating band. The chart below illustrates three metrics, 2 observable the other an estimate, that BOC watchers pay close attention to: core inflation (in dark blue), the BOC target (i.e. policy) rate (in teal), and the output gap (in brown measured against the right Y-axis). 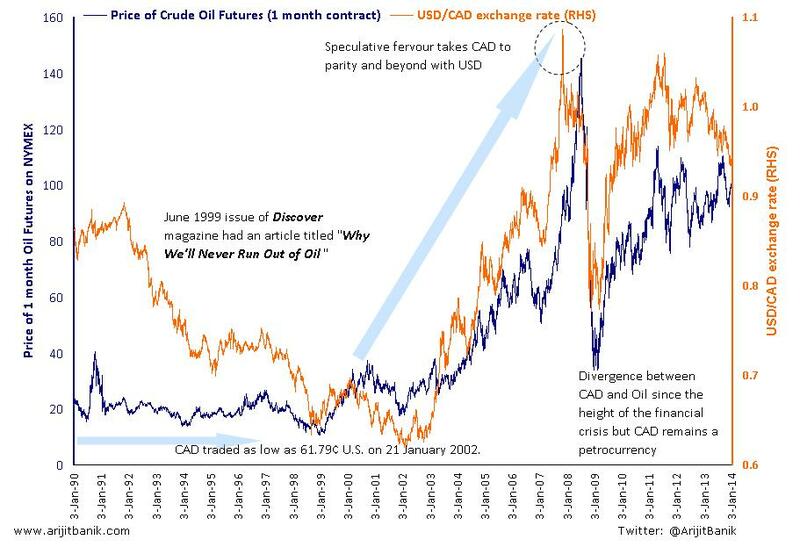 It is the latter that should be reason enough to believe that the BOC policy rate will continue to flatline for the short term (2 years) as the slack in Canada’s economy continues to widen despite a low nominal central bank policy rate, credit extension by the banking sector, and federal and provincial governments that are running budget deficits. 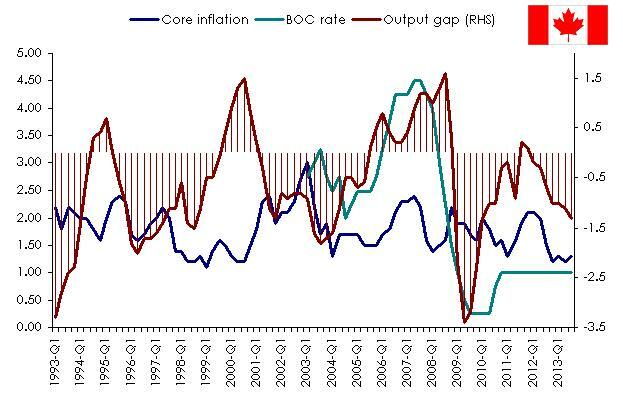 My personal view is that there is no reason for the BOC policy rate to move up before the 2015 Federal elections. The Conservative government of Stephen Harper will be running, according to its Executive Director Dimitri Soudas, on a platform of supposedly ‘strong, stable leadership’ (below). Moreover, there is the determined effort on the part of the current Conservative Federal government to ‘balance the books’ and return Canada to the promised land of budget surpluses. For a graphic on how federal governments from the time of Lester B. Pearson’s Liberals to Stephen Harper’s Conservatives have fared in this endeavour, see this graphic from the CBC. The idea of conflating the budget of a federal government with that of a household is attractive but it doesn’t work for Canada; it can for other nations, such as those under the monetary straitjacket of European Monetary Union, but it doesn’t make sense in the Canadian context. Every nation has a particular political economy to deal with that is the legacy of history and goepolitical relations. Moreover, the nature of a nation’s currency –is it sovereign or is it shared or pegged to global reserve currency– is worth considering as is the composition of that nation’s debt ownership. 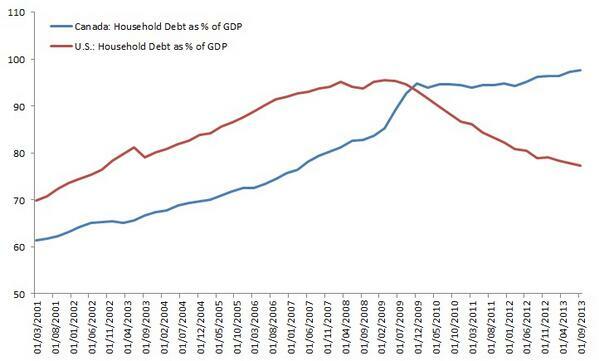 Currently, the Canadian context is one where the household sector has taken on an increasing amount of debt –both residential mortgage and consumer– that will be serviced for the coming decades and at the same time the federal government has gone into deficit spending mode since the 2008 financial crisis. The Bank of Canada understands this and has made the explicit assumption in previous Monetary Policy Reports that the business sector would drive growth in the economy through capital investment. That hasn’t happened. Arguably, businesses require signals from the consumer in order to have the confidence to enact capex. Say’s Law need not apply for most companies: supply does not create its own demand. The decision in favour of capex is demand driven. Absent that effective demand, businesses can propel growth via a combination of increasing efficieny or financial engineering. 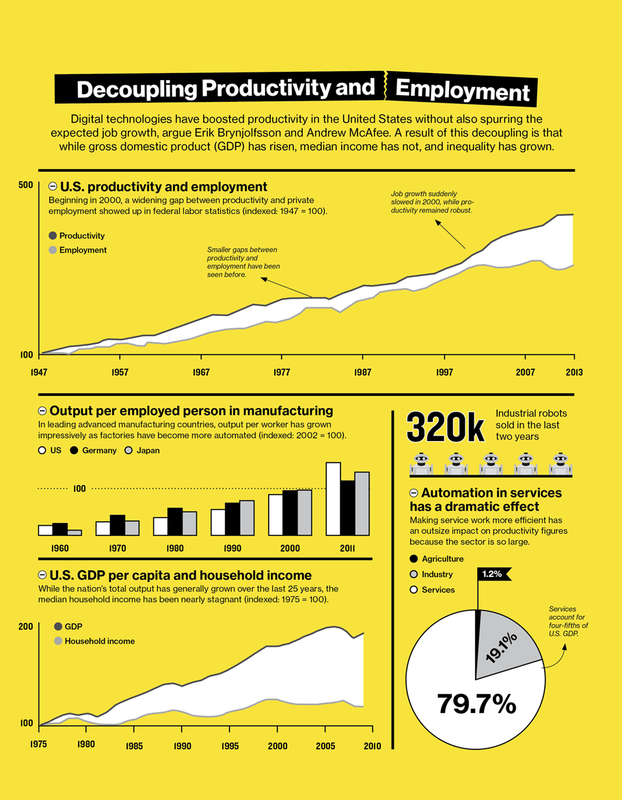 The former prescription has meant offshoring, outsourcing, and hiring more workers as temporary and, increasingly, the autommation of work that requires fewer and more specialized workers (if any as the graphic below concerning the decoupling of productiviy and employment illustrates). The latter prescription has meant, at best, bringing leverage onto a company’s balance sheet as a catalyst to translate modest top line sales growth into robust bottom line profitability and, at worst, aggressive revenue recognition to make a balance sheet and income statement look better than it really is. Fundamentally, the deficits of one sector emerge as the surpluses of another. If we consider the debt burden of most Canadian households in terms of the stock of liabilities divided by the flow of income, we recognize that the moribund income growth entails curtailing future discretionary consumption. 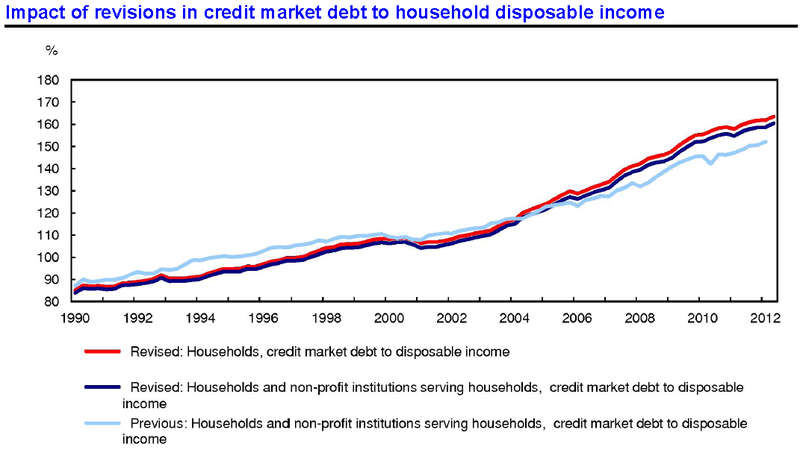 Canadians have brought forth a lot of future consumption by taking on mortgage and consumer debt. This requires debt servicing. Furthermore, the demographic factors facing Canadian society are a challenge that this country’s policy makers are inadequately prepared for. As the dependency ratio increases, the growth trajectory decreases: older Canadians, many of whom have saved inadequately for retirement, won’t consume as they did during their working years. Market rates will continue to ebb and flow on the steady trickle of economic and financial data. Mortgage rates, in turn, will go up and down as a result based on the risk appetitite of the major banks. What won’t change is the policy rate: the Bank of Canada will be circumspect in articulating an easing bias as it won’t want to further inflame a housing market that is becoming expensive for most Canadians yet, in the face of the head winds facing the economy it is unlikely how the slack out of the economy will disappear over the coming years. Do you get rewarded for ‘risk’? Pension plans take note: Above is a chart posted by Tom Brakke (Twitter handle: @researchpuzzler ) and his post is here (Hat Tip: Tejus Sawjiani). My point in posting his fascinating chart is that pension plans are forced into asset allocations that favour riskier asset classes but is this the right approach? 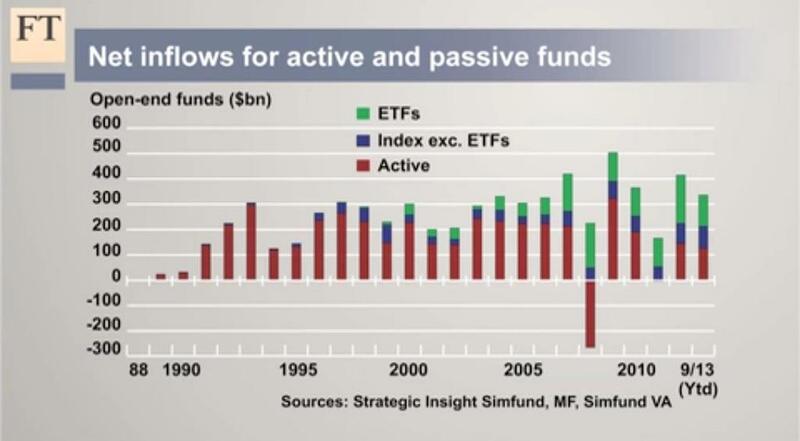 We cling to a paradigm of greater risk giving you greater reward but if this supposition were true then why has the investment industry been quick in pushing low volatility products? Whether we like to acknowledge it or not, macro counts for a lot more than investment analysts believe. Value investing works when macro factors align not in spite of those factors. By the same token, the resurgence in equities after the financial crash of 2008 has been due to flow of funds aided and abetted by the reflationary policies of central banks. (I have written on my personal thoughts vis-a-vis Bernanke’s version of quantitative easing here.) Will the visible hand of central banking continue to reflate equity markets or will funds flow back to US treasuries and corporate bonds as the global economy faces the reality of overcapacity, low effective demand and household deleveraging? 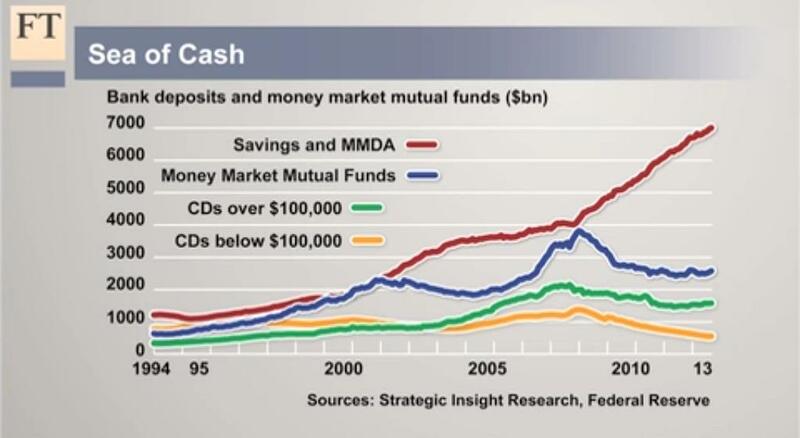 10 Trillion in Cash – Where is it going? What happens to financial capital looking for a return? 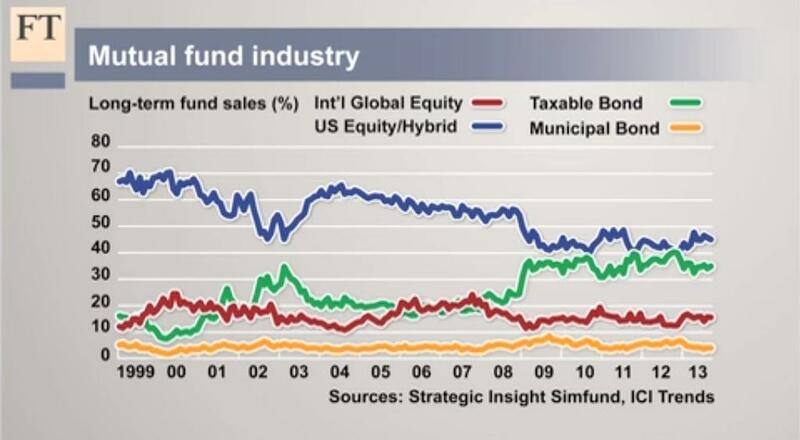 In this case, that financial capital is 10 Trillion dollars and, as US equity returns attest this year, those funds have been deployed in risk assets. In this video FT’s John Authers speaks with Avi Nachmany, co-founder of Strategic Insight. Great Rotation Out of Bonds?